Posted August 1st, 2018 by Jenna & filed under PREVIEWS, Theatre. Theatre Calgary’s Shakespeare by the Bow is back after taking a break for the Calgary Folk Fest. 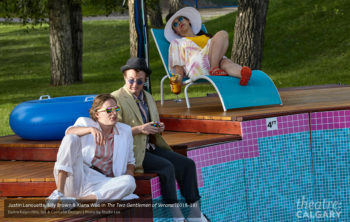 This year’s play is The Two Gentlemen of Verona directed by Dean Paul Gibson and featuring 12 young emerging artists from 7 post secondary institutions across Alberta and the country. “We sent out a notice to all the post secondary institutions in Alberta,” says Kadri when asked how they select the artists for the program. We really want to spread the importance of building the talent within the community. This program has been very successful because we have seen many of the artists cut their teeth on Shakespeare and go on to have successful careers as artists. Some are in our community some are abroad.” Kadri himself started at Shakespeare in the Park. Every production is not without its challenges and certainly the main one for Shakespeare by the Bow. If it’s too hot or storming, performances can be cancelled. But it’s “part of the charm,” as Kadri puts it. Oh and The Two Gentlemen of Verona is set in the 80s. So it’s bound to be a lot of fun. Shakespeare by the Bow is back tonight! Check Theatre Calgary’s social media either on Facebook or Twitter to make sure the performance is still on. Their performance schedule is available online.